First-year Incline head coach Indra Winquest celebrates the Highlanders' Division III state championship win with the Incline crowd and his players on Saturday. The title was the Incline girls' first since 1985 and third in school history. RENO — You’d never know the Incline girls hadn’t won a state title in 29 years. The Highlanders came out cool and confident in their Division III state championship matchup against three-time defending state champion Pershing County on Saturday, looking like seasoned playoff vets as they rode strong efforts from their standouts to a 53-38 victory. 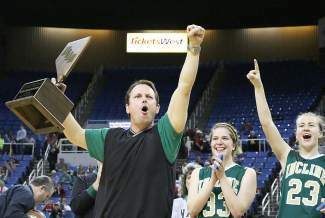 It was Incline’s first state championship in girls basketball since 1985, and third in school history. “It feels awesome. We’ve been waiting for this all year,” said Incline senior guard Kortney Solis, who hit several big shots and finished with 10 points in her final high school game, which was contested at Lawlor Events Center. The Highlanders used a scrappy full-court press to create turnovers and fast-break scoring opportunities against the defending champs. Combined with their accurate shooting touch, they ended a closely contested first half with a 12-1 run to take control with a 31-19 lead. The Mustangs would not go down without a fight, however. They cut the double-digit lead to five early in the fourth quarter and had momentum on their side. Again looking like the perennial champs, the Highlanders maintained their poise under pressure and fended off the attack, outscoring the Mustangs 13-3 down the final stretch to cruise to the title. Incline junior guard Molly Franklin, playing the point in place of the injured Torii Baker, took it to the Pershing County defense throughout the contest, driving aggressively to the basket and connecting from range en route to a team-high 20 points. While Franklin did her damage, Incline senior post Kerrie Tonking and sophomore Kira Porter combined to control the boards and hold league MVP Melissa Gonzalez in check when the Highlanders needed stops most. Gonzalez still finished with a game-high 25 points, but was contained to only five in the fourth quarter. In addition to her defense and rebounding, Porter played a smooth offensive game in the post and finished with 10 points. The state championship win was even more satisfying for the Highlanders after losing to Pershing County in the regional title game, 49-46, the previous week, sending Incline to state as the No. 2 seed. Incline, which lost only one league game en route to the regular-season title, defeated Pershing County twice during the regular season. As Porter and Tonking did their best to contain Gonzales in the post, Incline senior Elise Nelson held Pershing County senior Hannah McCurley to just six points, a night after she paced her team with 20 in a 61-37 semifinal win over Needles. Franklin also stepped up defensively, holding junior guard Abby Bake scoreless. “I think the key to this game was our containment of their No. 12, Hannah McCurley,” Winquest said. “I think she had six or seven 3s last night in the semis, but Elise just bottled her up. She didn’t give her anything. Nelson contributed seven points, while Tonking added four and Sarah Wright two. Incline, which defeated top Southern seed Lincoln County 50-42 in Friday’s semifinal, posted a final record of 25-3 on the season. Pershing County finished 26-4. The Highlanders will graduate six seniors from this year’s team — Solis, Tonking, Nelson, Baker, Wright and Caroline May.